Doggles dog goggles are designed to protect dogs' eyes from the sun's harmful rays, flying debris, wind, rocks, or bugs. Your dog can't tell you his eyes hurt, so be proactive and help protect your pup's eyes! Doggles also come recommended by Vet Ophthalmologists to protect their patients in all types of situations and also after some types of eye surgery. 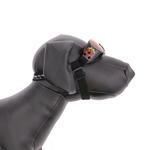 And don't forget that these Racing Flames Frame and Orange Lens Doggles are in the height of dog fashion! Doggles - ILS Racing Flames Frame with Orange Lens Customer Photos - Send us your photo! Canan loves wearing his doggles on the pontoon while cruising the lake! Zack is a large Black Labrador, maybe a LabraDane at 100 pounds. He will wear whatever I put on him and he knows, whatever he wears, he makes it look good. Deezel is a fun, friendly and quite a hunter. When dad is around he never wants to be left behind he rides on everything from Motorcycles to Jetski's. Ears flopping in the breeze and his doggles keeping his eyes protected. He's a poser! Seamus wears his Doctors to help prevent corneal ulcer, he had two in six months. The doggies are comfortable and look awesome! He never tries to take them off! Minnie loves to sit up on the console inher car seat and sport her Racing Flames Doggles from Baxter Boo. Has others to go with her different outfits shae is a Baxter Boo Princess! Finn is a corgi/lab mix and at two years old is still pure puppy! Spike loves riding around with the top down in his Racing Flame Dog Goggles. Alligator loves wearing her flaming hot doggles on her bike ride to the lake. Max out waitin for his ride in his new Doggles !! Opie's ready to go wheelin! Peanut is a rescue dog that was found in June under a car in a business parking lot when it was 118 degrees. He was barely 7 lbs and sick. Have had him for a year and half now and he is ready to experience whatever is next. He wears his doggles while riding with me on the golf cart on week-ends and knows once I reach for them that he is going for a ride with his buddies! I hadn't taken the stickers off these cool glasses yet when this pic was taken. We were trying them on for the first time. Calvin didn't want to take them off! He was lovin' making me laugh and tell him good boy. These are a size L. They run true to size. Calvin is 85 lbs. and they are almost too big. He loves them and I can't wait to take him for a ride in the convertible with them! Emmett is too cool for school in his flame Doggles! Gosh......mommy these Goggles are so cool. They even have flames on them that's hot!!!! Thanks BaxterBoo your awesome. Nothing like a breeze on a Sunny afternoon. Now this feels great, this is how your suppose to relax. And to top it off, I have my Goggles from BaxterBoo to protect my eyes from to much wind. Gotta love them Thanks ! Yeah.......... I think I'm real cool in my new Goggles. 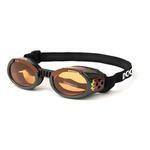 They even have flames on side of my Goggles, I love them. I'm so ready for this summer to put my Goggles on. Look out everybody. Are we leaving? I'm ready for that long drive. I know the wind will be blowing but now My eyes are protected with my new Goggles and I'm styling. Come on mommy. Discerning California dogs wear the latest in canine fashion eyewear, with 100% UV protection, of course! Since Jesse squints in the bright California sun, his human got him these stylish Doggles! Benji loves riding in the convertible but his eyes water so bad from his hair whipping around. So we decided to try these. He wears them really well for never trying anything on like this before. I'm sure he'll love them in the car!! I bought these for my other dog and Doo was so excited- he wanted them too! He loves them... and is anxious to try them in the convertible! Kaner out for a ride in his new doggles!!! He was excited when everyone honked at him! My rescued Pom..Nemo! Getting ready for a day in the park in sunny Vegas. Doggles work wonders for Nemo sun sensitive eyes. Henry is a 5.5 month old, 95 lb, deaf Harlequin Great Dane who loves to be fancy! This is a photo of Chico Ward. He uses the doggles on motorcycle rides. It helps to protect his eyes from debris. He is able to wear them even at night because the lens is orange. Junior is a long hair Dachshund. He likes to take rides on his custom lead sled stretch cruiser. He loves his new Doggles from Baxter Boo. Thank you. Big "O" loves the feel of wind in his hair, top down and ready to cruse the streets of Portland. Nino is an adventurous dog who enjoys the wind in his fur...but not in his eyes. Thankfully, his new Doggles allow him to fly freely in the breeze without watery eyes! Nino also enjoys long walks and afternoon naps. This is a picture of my riders. This bike is theirs, but they ride on our Harley. They can't wait till it's a little cooler for riding weather. Looking Cool while keeping my Eyes safe from flying thingies! Chico and Charlie love their doggles. The doggles are part of their riding gear on our Harley Davidson. Trapper is ready for some fun in the sun with his Doggles! Myles sporting his doggles while riding on my scooter. Tobias with his stud muffin "Doggles." Einstein is styling in his Doggles and pink for Breast Cancer Awareness at the Buses at the Brewery event in Springfield, Missouri. This event showcased VW air-cooled buses. Einstein is in his Aunty Dia's 1973 Perplex Pink Super Convertible VW Beetle. Photo by Dia Hudson, October 8, 2011. As first mate, Bailey knows safety is first. He wears his doggles for protection against the salt spray while zoomin' in the boat! Wearing their doggles means "fun times" for Bailey & Lexie. Whether it's at the beach, zooming around on the boat, or just fun in the sun, they are stylin' & protecting their eyes at the same time. Tazzy with his new Doggles.... I think he digs them! I ask him if he wants his goggles. If he does, he pushes his head through the straps. If he doesn't, he pretends not to know me. He's like the Fonz. Only a dog. Racing flames frame with clear lenses. Rides on the back of my motorcycle with them and doesn't seem to mind them. They are small and fit perfect. Here is my precious callie in all his glory, he is two years old now and wears his goggles or sunglasses every time we go in the pool. I'll do anything if it means I can hang my head out the window and catch the breeze. Cami loves wearing her doggles when she's riding in the car! I love my new glasses! But I have to get used to wearing them. These are super cool! Thanks Mom and Dad! Dozer's new Doggles protect his eyes and make him the coolest dog in the neighborhood when he goes for a ride with mom! This is Rider with his doggles. He rides in the sidecar on my motorcycle. Started riding last year and we just ordered another pair (flames) and are thinking of getting him the Optix to wear. We won't let him ride without his doggles. Petal can look at the rushing scenery with eyes wide open with her Doggles! When they're on, she doesn't seem to mind them.. maybe she knows they're keeping her eyes protected. Jake likes to hand his head out the window when we're driving and his doggles keep the bugs and other stuff from hurting his eyes. He also wears them at the beach to protect from sun damage. People think he looks cool too and it makes them smile! Bacchus usually wears his doggles when riding in the car, truck or Jeep but this was taken during our July 4th camping trip. He was the coolest dog at the campground. Karen and Bela go biking and the goggles with flames were just too perfect for BurningMan! Bela drapes over her basket. Karen and Bela go biking and the goggles with flames were just too perfect for BurningMan! We're going to the playa! This will be her 6th Burn! (It's a no DOG event) I'll send photos when we are riding around on the bicycle together. Nothing beats Doggles for keeping eyes open when getting high velocity sniffs out the window! Ready for cruisin' in the summer sun! Look at me! Aren't I handsome?... I'm Moon! Jake loves his Doggles when riding in the motorcycle sidecar and on the four-wheeler. Posted On 01/31/18 by Judy S from Lapeer, MI Yes, Judy S recommends this product! Good protective eyewear and snug fitting. My dachshund enjoys wearing them riding upon a motorcycle. Posted On 09/09/17 by Waycool from , Yes, Waycool recommends this product! Fits perfectly very stylish, Way Cool! Posted On 06/21/17 by Stacy Wolowicz from Phoenix, AZ Yes, Stacy Wolowicz recommends this product! Posted On 06/05/17 by Mary P from Watertown, Yes, Mary P recommends this product! Tucker now thinks he is "Tucker Cool" wearing his new goggles while sitting in his new forward pouch going for a scooter ride. It may not be a Harley he says ... but just as manly because of the flames. They fit him well. The foam limits the wind protecting the eyes along adding to a better fit. He says "Thanks .. BaxterBoo!!" Posted On 05/31/16 by Cijai B from , AZ Yes, Cijai B recommends this product! Posted On 09/02/15 by RoxAnn N from Defiance, OH Yes, RoxAnn N recommends this product! We absolutely love these! People are asking me about them and I have been sending them a link! Will be ordering another pair for Rebel!! Thank you!! Posted On 08/28/15 by Sharon S from Keller, AL Yes, Sharon S recommends this product! Posted On 06/04/15 by Karen F from Vineland, NJ Yes, Karen F recommends this product! I purchased these Doggles for my 14 pound Shih Tzu. I got the size Small and it is a perfect fit for him !!! Posted On 01/09/15 by Reno Redhead from Reno, NV Yes, Reno Redhead recommends this product! I got these for my dog because he loves running though brush after rabbits. I was worried he'd damage his eyes. He wasn't sure about the Doggles, so I didn't use them. You know what happened. He got a corneal scratch, and the vet said to keep him on a leash for a few weeks until he'd had a chance to heal. The pup was pretty unhappy, so I put the Doggles back on and we went back out on the trail. Keeping the Doggles on was a quick lesson; Doggles off, leash on, Doggles on, leash off. It didn't take long for him to get back to chasing rabbits with his Doggles, his eyes protected. Happy dog, happier partner. Posted On 12/10/14 by Lisa & Pestle from Eugene, OR Yes, Lisa & Pestle recommends this product! I ONLY USED THESE FOR A SHORT TIME AS AN ASSESORY TO AN OUTFIT!! THEY FIT GREAT, TRUE TO SIZE. Posted On 11/07/13 by KGM from Ukiah, CA Yes, KGM recommends this product! These goggles are very well made with the dog's health and comfort in mind. Not just a fashion statement, these are a must for breeds with prominent eyes (Boston, Pug, etc) to protect them from sun exposure and developing Pigmentary Keratitis. Personally, I use them for my blind (both eyes removed) service dog to prevent people from approaching her with negativity. They have greatly enriched her life. BaxterBoo offers a great variety and their customer service is exemplary.